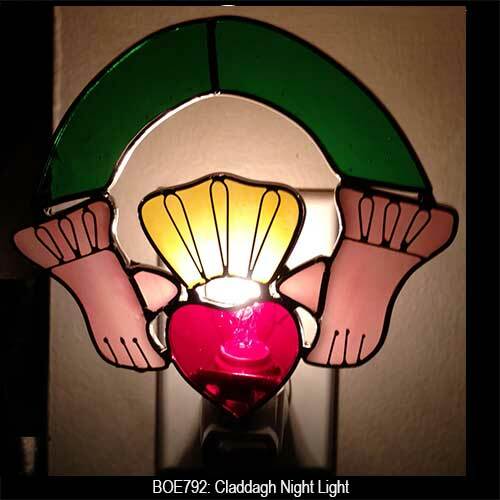 This Irish night light features stained glass hands, heart and crown of the Claddagh. The UL listed Irish night light features a deluxe 360 degree rotation socket with a power switch and a polarized plug. This Irish night light features a colorful stained glass Claddagh that features a red heart, flesh tone hands and a gold color crown. The Claddagh night light will provide decorative accent lighting or will safely illuminate a child's room. 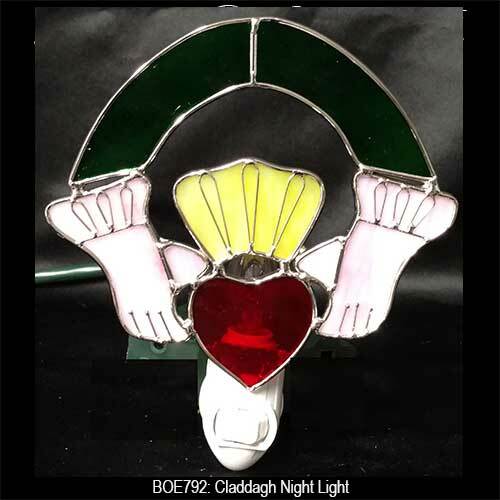 The stained glass Irish night light with metal accents measures 5 3/4" wide x 6 1/4" tall and is gift boxed with a bulb and the Claddagh legend.